The chancellor is to quiz bank bosses over how much they charge small firms for loans, saying he is "extremely concerned" their rates may be too high. 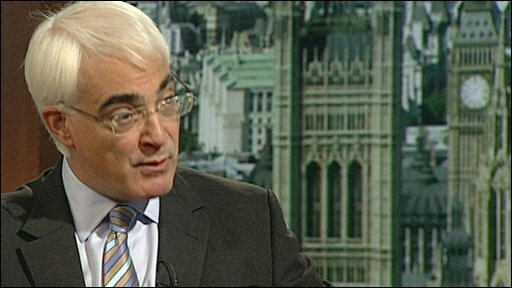 Alistair Darling said the cost of loans seemed to have risen, despite the UK's record low base interest rate of 0.5%. He told the BBC that banks had a duty to restore lending levels, saying the government did not rescue the banking sector "out of some charitable act". He has called a meeting with bank executives in Downing St on Monday. "The public will not understand it if they [the banks] don't seem to be doing their part," he told the BBC's Andrew Marr Show. "I want them to rebuild their balance sheets... but at the same time, because of the particular circumstances we're in now, because of the fact we've got this recession, we also need them to lend money," said Mr Darling. "And that's why we re-capitalised them to do that, and that means they've got to live up to the promises that they made." A number of banks needed emergency funding from the government due to the credit crunch. They included Lloyds, which owns Halifax and Bank of Scotland, Royal Bank of Scotland (RBS), which includes NatWest, and Northern Rock. Others, such as Barclays and HSBC have not needed any government cash. Mr Darling's comments come after a report by financial website Moneyfacts claimed banks' mortgage profits had increased nearly fourfold in recent months, despite the base rate remaining at a record low of 0.5%. It said that margins were the largest seen since it started keeping records in 1988, having risen from a "typical" 0.8% margin on top of a mortgage product to 3.1% margin now. Three months ago, the price of a typical two-year fixed mortgage was 4.65%. Now it is 5.17%. Angela Knight, the chief executive of the British Bankers' Association (BSA), said banks had to pay a lot more than 0.5% for the funds they themselves borrowed in the wholesale money markets, and they had to pass this on to customers. She said that despite this, the banks were now "stepping up" to meet the increased demand for small business loans. BBA figures due out on Monday are expected to show that industry-wide lending to small firms rose by £391m in June. This compares with the £153m rise in May, £287m increase in April, and £271m gain in March. However, Stephen Alambritis, chief spokesman for the Federation of Small Businesses, said the chancellor was "quite right to haul in the banks". "It is hugely important that Mr Darling keeps tabs on the banks to ensure they are lending money to firms, and at fair rates. Firms need to be able to reap the benefits of the historically low base rate," he said. Shadow Treasury minister Mark Hoban said the government had let small businesses down. "They promised action in January but have not delivered by July. This failure is costing jobs and businesses," he said. Liberal Democrat Treasury spokesman Vince Cable added: "It's time the government stopped being a passive investor in the nationalised and semi-nationalised banks and ensured that they maintain lending to good British companies for the wider interest of the national economy." Mr Darling also reiterated that VAT will definitely return to 17.5% from the current 15% level at the end of the year. The rate of VAT was reduced to 15% on 1 December 2008 to help boost retail sales. Turning his attention to the wider economy, the chancellor said he was sticking to the prediction that the recovery will start "at the turn of the year", with modest growth being seen in 2010. Official figures showed last week that the UK economy continued to contract between April and June, although at a slower rate than between January and March. The economy shrunk 0.8% last quarter, compared with a decline of 2.4% from January to March.